Puto bumbong derives from the words “puto” (steamed glutinous rice) and “bumbong” (bamboo canon or cylinder). 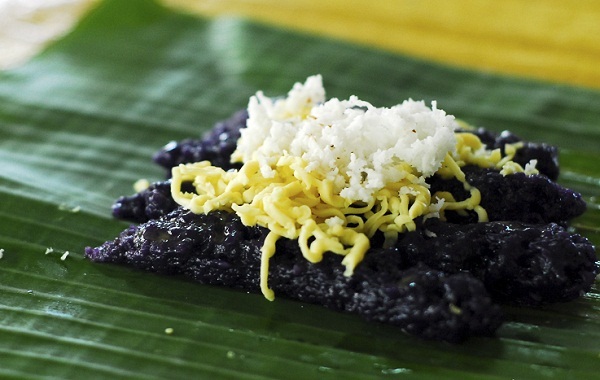 Puto Bumbong is made from soaked, ground glutinous rice called Pirurutong, which has a distinctly purple hue. It is poured into bumbong or bamboo tubes, then steamed until cooked. It is usually topped w/ butter, fresh coconut shreds, & muscovado sugar (cane sugar) just before serving. The secret of a puto bumbong is the usage of the right ingredients to achieve a greater harmony. Muscovado sugar gives a hint of nutty sweetness that refined sugar doesn’t give, then having fresh coconut shreds gives the texture and cuts the stickiness of the roll. 1. Soak glutinous rice in water overnight. 2. Grind the soaked rice. 3. Mix food color while the glutinous rice is being ground. 4. Wrap the ground glutinous rice on a piece of muslin cloth and place it in a strainer to drain excess liquid. Another technique in draining excess liquid is by pressing a heavy object that has been placed over the muslin cloth. 5. Once the ground rice has slightly dried, rub it against the screen of a strainer to produce coarse grained rice flour. 6. The rice flour for making puto bumbong is now ready to cook. Fill each bamboo tube (bumbong) with just enough glutinous rice and put them into the steamer. See to it that the steamer contains boiling water. 7. Steam rice flour in the bamboo tubes for 10 minutes. 8. Once cooked, shake out the contents of each bamboo tube or remove the cooked glutinous rice from the bumbong with the help of a knife. 9. Spread butter on the puto bumbong and place a small piece of panutsa (sugar cane sweets). 10. Add toppings before serving. This recipe is good for 6-8 pieces of puto bumbong.